I live just a few miles outside of New York City, so when 911 happened, my world was rocked harder than most in the world. After getting my daily dose of hate mail this week about taking pictures at the 911 Memorial at Liberty State Park in Jersey City, I thought I'd write about it. Liberty State Park has floods of professional and amateur photographers there every day taking photographs of the 911 Memorial for every reason under the sun. Some for personal use, some for selling to stock footage and news channels, or others like me who photograph people around that area. The area surrounding the memorial has an old train station, a lot of greenery, and a great view of the NYC skyline and waterfront. 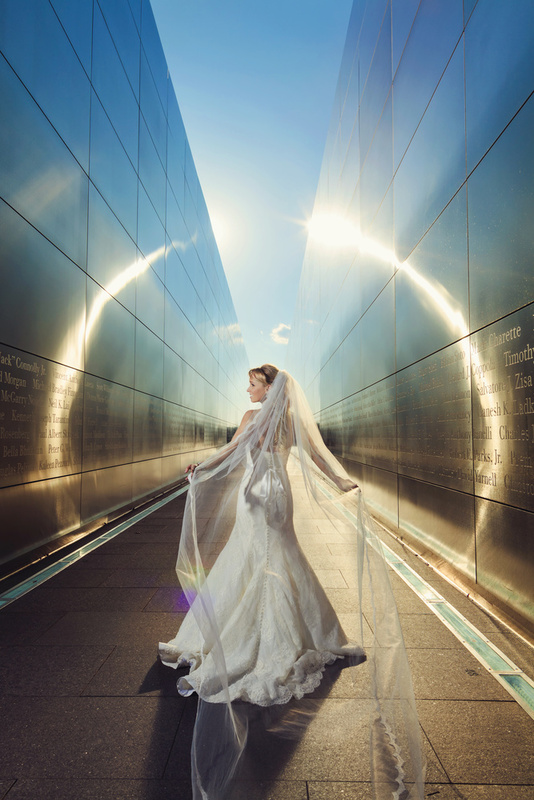 The first time I ever photographed there, it was for a bride of mine who's father was a police officer that died on 911 saving the lives of many. It was so meaningful for her to take pictures there with her husband and I was happy to do it. Since then, I've taken many brides there to be photographed because I find it meaningful in a positive way, not a disrespectful one, because of my first interaction with it. There is also a reception hall at the end of the park, so this is the practice of many photographers working there. However, after having people send me hate mail about my "offensive" photographs I began to wonder what the truth was. I was taught from the daughter of a 911 victim that those photographs are anything but offensive, but others were telling me the opposite. Am I just ignorant to the possibility of offending others by photographing at a Memorial that thousands of people photograph every week? Should photographers care if their photographs are offensive to those who aren't paying clients? Or are the offended being over-sensitive, and from the looks of a quick Google Image Search have a lot to be over-sensitive about (and a lot more hate emails to write)? There are so many beautiful memorials around the world, like The Lincoln Memorial in Washington DC, that professionals and amateurs photograph every day. Is shooting there equally as offensive to some? What stance should we take when our clients want to photograph at memorials? Is it just a personal conviction that should influence our choice to photograph at these places, or a public one? I find your pics awesome, not offensive since the daughter of the police officer asked that you take a pic where her father died is a tribute to his memory... the pics are awesome and not offensive. Thanks - though I'm really looking for public opinion on it overall - that was my first experience there, but as you can tell these are two different brides up here so I've photographed there since without that special request. Is it only ok if a victim's family member asks to be photographed there then? I'd say the one that had the father that died on 9/11, no problem. The one that had no real connection to the place other than high shiny walls looking good for a photo...ehhh not so great IMO. Then again, folks should be directing some of the hate-mail to the brides and not just you if they're requesting that spot. As far as comparing this location to the Lincoln Memorial I think it's a bit different. Yes both are honoring people but one is honoring a single president assassinated over a hundred years ago and one is honoring hundreds of people killed in a terrorist slaughter a little over a decade ago that is much fresher in our collective minds. I wouldn't do a bridal shoot at Pearl Harbor either for what it's worth. I doubt you will get a clear answer, though most of the replies here carry a valid point or i shall say arguable point. I think the taking of the photographs had the correct "permissions" and intent. Where you maybe went wrong is showing them publicly. Yes, you were asked to shoot them by a person that had every good reason to do so . They are personal , private memories to her and her family. Perhaps you should have kept them private as well. Her reasons come off as emotional, you're showing them comes off as commercial. People are reacting to that. I don't think it's offensive at all, but then again, I have no emotional connection to those lost on 9/11. First I'd have to understand why people find it's offensive. I can see it in a broader sense, but why would people feel so compelled to actually write to you about it? I find the pictures themselves beautiful and I don't find them offensive personally. Aside from the daughter of the police officer, I am not sure why someone would want wedding pictures taken at a place that is designed to remember those that have passed. It's an interesting choice of location, albeit a beautiful one. I have no problem with shooting photos here. I think your pictures are beautiful! Its a beautiful site. What offends me is that it took them as long as it did to rebuild that location - ridiculous and it is testament in itself to the paralyzing fear people have of offending someone. I took something like two years to build the entire empire state building - how far we've come. While I think your pictures are stunning, I do find this to be in poor taste. In the event that someone has a personal connection to that day or wants to honor a fallen loved one, I think an exception can be made (though I suspect this is very rarely the circumstance). It’s tantamount to taking photos on the Pearl Harbor memorial, or any other symbol of loss and remembrance. Very recently, an NBA player took a selfie at the Holocaust memorial, to the great ire of all who saw it. I wouldn’t characterize those who took issue with it as being over-sensitive, nor would I characterize people as over-sensitive for being offended at using a 9/11 memorial as a canvas for a photo op. All Americans lost something that day. We all have a connection to that day and no one has more right to be photographed there than anyone else. Keep up the good work, Vanessa. I too, live in the area. In fact, I was on a conference call with a group of folks directly across the street when the first plane hit - So for me, this is personal. 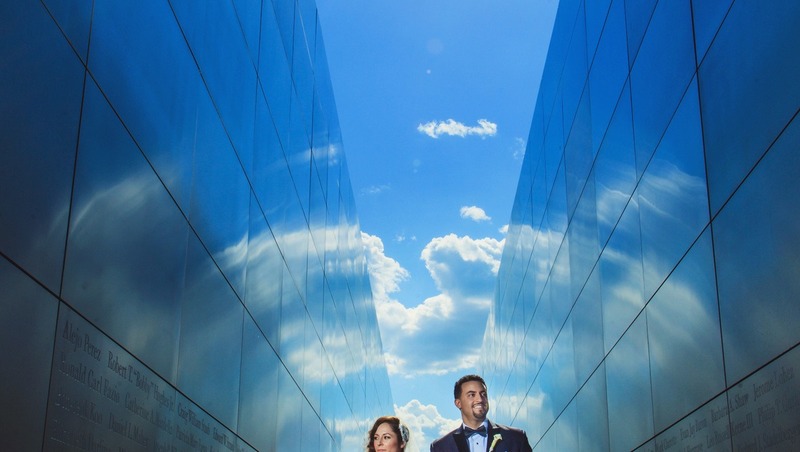 A bride memorializing her father's sacrifice in her wedding pictures is personal, too. However, for those who find this offensive, I think I have to strenuously disagree. This was an event that affected the world. I think we all relate to it in some measurable amount. If they were not personally involved , they want to develop a connection to become personally involved. Yes, this is still a raw and bleeding wound and we want to nurture its healing. 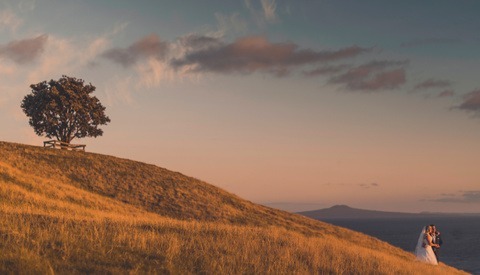 Connecting a life event, such as a wedding, with another live event such as a massive trauma effects a healing and tells a story for future generations. There is no disrespect in love. Love is found in weddings most assuredly; but love is found in an outpouring of empathy whether you knew victims or not. For many days, weeks and months after 9/11, people wanted to feel the love in a lost family member, co-worker, neighbor or friend. This feeling is also transferred to strangers. Should we not welcome visitors to the reflection pool at ground zero if they did not lose loved ones? We capture their tears, the horror on their faces and the love as they pause to reflect in a camera's shutter button. Jersey City created a moving monument in tribute. That tribute radiates love and love is related in tears, sadness and joy found in weddings. This is no more intrusive or disrespectful than images captured anywhere else. Part of our personal history, part of our country's heritage. It belongs to all of us in the capacity we choose to embrace it. I totally agree with you and this is deep understandable logic. Here is the thing, normal people and even educated ones sometimes get logic blindness and sometimes emotions clouds their minds heavily. Those who get emotional are hard to convince or to argue with. Personally, id rather take pictures as a tourist there to remember the place and feel it. But i don't think i would dance or make a happy event out of it. But hey, everyone see it in a different way and thats normal. Hateful email, this is over reacting and extreme in my opinion. Your first priority should be to your clients and the photos and locations that have meaning to them. Its good to have some cultural awareness and sensitivity, but also realize that our digital world makes it far more likely that people will see and complain about our images. In the end, be true to yourself and your clients and realize its impossible to make everyone happy all the time. I think it's an unusual place to have a bridal shoot if the couple has no connection to the place. I'm not sure if it comes off as offensive to me because I wasn't there and have no personal connection. I can see how some people might be offended that memorials to honor the dead are being used as a cool place to take wedding photos. I'd probably refrain from using those photos to promote myself because I don't like to deal with political drama. For my personal work, I spend quite a bit of time in cemeteries so there is some comparison. I've had my fair share of people blatantly chewing me out to my face in spite of my strict set of self imposed rules that give the utmost respect to every person, living or dead, in a cemetery. I can't see ever using cemeteries for a bridal shoot. Perhaps for some personal photos for someone who lost a loved one but even then not in a wedding gown. I agree with everyone who thinks that it's really only appropriate if the bride or groom has a special connection to the spot. 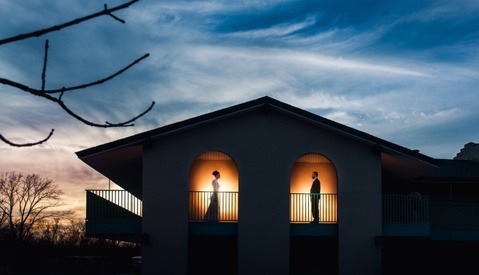 As wedding photographers, it's our job to tell a story. Without that specific tie to the 9-11 memorial, it's not part of the story, IMO. Otherwise we're telling the story much like many musicians tell theirs via music videos nowadays -- with no real purpose except the WOW factor which doesn't end up making sense if it has nothing to do with what the message of the song is. I wouldn't necessarily mark it as "offensive" if you choose to go there regardless...I just don't think it fits unless there's a reason. I'm not offended. But if I was, does it matter? People do not have a 'right' to not be offended. If someone is offended, that's their problem. Use your camera how YOU see fit. Not how others dictate. I think those photos are beautiful and inspiring. There's some great symbolism in celebrating a wedding and all that it represents (hope, love, life, etc) in a place where such a tragedy occurred. I don't think someone needs to have personally known someone who died at ground zero to feel a strong emotion connection to the place. I have never been to NYC and yet I feel a great deal of empathy for all those families that were affected. I imagine many NYC residents feel an even greater connection to such an important place/event. Some people want to celebrate and honor that connection. Others want to be offended by anyone that does so. Focus on the positive; filter out the negative. Simply because photography is permitted in the area doesn't mean all is far game. A tourist snapping a shot is different to me than a commercial photographer working for profit. Your first client, I think its ok. In fact I love it. Reminds me a young plant taking root among the rubble. I've also seen pictures of family member at the headstone of another family member who has passed. But that's different than someone just going into a cemetery for a "spooky halloween feeling" picture. You have to evaluate motivation. Are you photographing there now mostly because of aesthetics? Is so, then you must accept that you are, to a degree, diminishing the symbolism of the memorial. 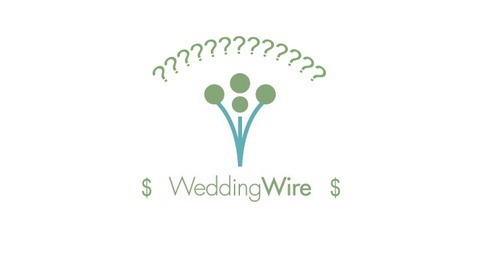 I'm willing to bet that your first bride would have cared less what the structure looked like. It was the meaning of what it stood for that was most important. And I'm also willing to bet that the brides afterwards were more taken with the aesthetics of the imagery rather than the meaning of the structure. I mean come on, they're spectacular shots! Who wouldn't be taken with the aesthetics? Respect and honor is something that's given voluntarily rather than just following rules of "photo are allowed" or "no photos are allowed". I believe you truly showed respect for the heroes and victims of 911 for that first bride. For the rest? Well, only you can answer that because only you know your true motivation. Me, I would hesitate to use it as merely a prop because that's my way of showing respect. I'd rather let the memorial speak to those visiting without a bridal party disrupting the moment because its big and shiny and looks cool. Everyone's got an opinion, but you know where your heart is. For this subject matter though, when in doubt play it safe. Its a great big interesting world to photograph. TS, very much agree, and your comment was so eloquent and well-thought-out, I find no need to leave my own other than to "thumbs up" yours. \It comes down to the context of the photo and how it used. That can be a tough call especially if you have never had to make the call. I am a bit jaded because I had to make many of those type of calls. From what you described you have a daughter in her own way trying to honor her father's memory. Someone who does know the context the photo may make snap judgement or just may react on a gut level. Years ago I had recording of a woman who, I would play to new photographers and interns at our company. I told them you will get a call like this one day, It was what I would say a complaint phone call. It started off as "Mr Berrett I am the daughter of the man you photographed the other day". My father that was in car accident. You could photograph the car, firemen but my father was BLEEDING. HE WAS BLEEDING!!!" At which point the call became unintelligible. Such is life of photojournalist at a newspaper. In this case her father had minor injuries and was released from the hospital that day. To put the photo in context it was an accident on a major highway that blocked traffic for hours. The photo showed firemen extracting the victim (her Father) from the car while treating a minor cut to his head. For the most part she was venting her emotions and frustrations from the incident, I which was fine. I think it important to understand and feel the emotions of a moment, event and the people because it makes for powerful shot. Part of it is a double edged sword, memorials have strong emotions tied to them, and when place people in them you are giving people something to focus on. If the audience does not understand why the bride is there and the context of the image, then the reaction will be negative. Also with some people that context of the image will not matter because of sacredness of the location. A long time ago I learned Freedom of Speech is not just a right but a responsibility. I don't find that offensive but I can understand some other people will find it offensive. I just can't and will not agree with all the hate towards the photographer, she makes beautiful photography. this does not bother me at all. i have never been to the memorial and had you not told me it was then i would never of known it. your client decides what they think is right or wrong. if they want it and it's allowed then go for it. who cares what people think of it, until they start paying your bills they have no say what your do. let them send all the emails they want, delete, delete, delete. i like the pics. So all that matters in this world it's what YOU think / feel and the money... Pretty lame. Bob, all he did was reply to a question about how we feel about it. First of all, let me congratulate you on the images themselves, the're beautifully composed and executed. In fact, these images might have been taken anywhere on the planet with similar walls heading east or west, and they would have worked equally well as pictures. So the location was chosen for effect (like, say, Mt. Rushmore) can be dismissed, I think. In fact, if I hadn't been pointed to the engravings and the headline hadn't said "9/11 Memorial", it wouldn't have occured to me at all. So again, photographic execution gets 10 out of 10, for good taste, composition and eye. However, I kind of find myself going along with steve chase in his comment down below, that great as these images are, they best had been kept private. 9/11 is still a sensitve topic, and too many people take things the wrong way (or the right way? I don't know, they take it their way...). There will always be people who will find anything you do offensive, unfortunantly it is the world we live in that the minority believe they should rule the majority with their over-sensitive pathetic views. I say as long as your not bringing disrespect to the dead (which you are not in any way) Stuff what other say and think because for every hater you can guarantee there are many, many more people who love your work and support it! Interesting article and even more so the comments. From my POV the bride with the Police Officer Dad was understandable and quite touching, the others less so. Yep, that name you can read next to her head left behind a pregnant wife and young son and he died in agony trapped under twisted metal crying for his mother as his skin bubbled and burned in the fire as some terrorists on the other side of the planet clapped and laughed in celebration...how romantic. Why would you associate your wedding day with thousands of deaths like that? There are different types of memorial some sombre and some celebratory, from what I can tell this is more the former. However, very nice photos and I'm 100% behind the freedom to do that if the bride and groom want even though personally I think it's in questionable taste. Your receiving hate mail is ridiculous, but welcome to the internet I suppose! first off, just looking at the photos alone, they're awesome! i love them, hearing the story behind it, makes it even more awesome! it really gives meaning to the couple in the photos. as photographers if your photos can move people emotions and feelings, good or bad your doing something right, in this case, its a good cause and not dishonest gain or respect. i really can't understand why people would hate or dislike this photo, from a moral and artistic view point. maybe the haters have a super bad connection with 911 and anything related to it and can't and still have to deal with it for themselves. either way these photos rock and as a wedding photographer too, this is the best feeling when you can deliver a images that will last a lifetime and get passed on for generations to come. great job, and don't get discourage. have a great week! good read, aloha! I would not shot there because I avoid anything controversial, be it political, personal rights, etc., when I am representing my business. People today are hypersensitive and one can easily lose potential clients because some hard-core liberal/conservatives take their convictions to seriously, never mind those that feel 9/11 is sacred. Are you right or wrong, do what feels right to you, should you get hostile emails, absolutely not, this is still America and no one should have the right to impose their beliefs on to others. I have been to New York City and it is an amazing city that I would love to have as backdrop for my weddings. I'm sure you can find other places to shoot while not hurting your business or image. Again, it's not you it's "them", but "them" are potential clients you just lost.